Who Needs a Monogram Sewing Machine? Gone are the days when every sewing task had to be done by a standard machine. Today, we have specialized machines, each catering to a particular sewing task. For example, we now have a special-purpose leather sewing machine to ensure impeccable leather stitching. A monogram sewing machine is also referred to as an embroidery machine. They have streamlined sewing design. It wouldn’t be wrong to say that monogram sewing machines have turned around both commercial and small-scale fabric design, creation, and production. Monogram sewing machines are purpose-built machines. Their sole function is to sew design patterns from threads on a fabric or a fabric-like material. So, this begs the question: who really needs specialized monogram sewing machines? A startup that deals in embroidered cloths can make the best use of monogram sewing machines. Large monograms on apparel have become all the rage in the last few years. So, if your business promises customers with customized embroidery designs for their clothing, monogram sewing machines are your best bet. Brand merchandising is not a new concept. So, businesses have understood it in all its senses to make the most of it. There are millions and millions of customers for merchandized products all around the world. Monogram sewing machines can give you an opportunity to tap into that lucrative consumer market. From table cloths to mobile covers, you can use monogram sewing machines to develop pieces with the logo of the customer’s favorite brand. It could be from any field. From automotive logos to sports team badges, the threaded monograms are in great demand among ardent fans. Monogram sewing machines are not just exclusive to purely commercial uses. You can also get one for your home. From school projects to home interior craftwork, a small or medium-sized monogram sewing machine can come in really handy for domestic use. Similarly, seamstresses can add more diversity to their work by getting their hands on monogram sewing machines. These days, the best monogram sewing machines available in the market are programmable. So, here, we will focus on the benefits of these machines. Do you do monogramming and fabric design-making from traditional sewing machines or by hands? Do have reservations about using this heavy-tech machine? Don’t worry, there is no rocket science involved with monogramming sewing machines. These machines are definitely manufactured to generate delicate and complex designs. However, their handling is totally contrary to that i.e. simple and trouble-free. You don’t need any prior knowledge or experience to work on monogram sewing machines. Their programmable nature and the working manuals provided by the manufacturers are enough to get going. The accuracy of stitching is central to the final quality of any monogram and design. Monogram sewing machines are excellent in that area. Once the design file is loaded and the process is stabilized, users don’t need to do anything except oversee the sewing patterns. Monogram sewing machines are fail-safe and flexible since you can adjust and change the design softcopy before it is fed to the machine assembly. The machine’s software lets you change the design before its materialization on the fabric. This way you can make any last minute changes relayed by the client or add a detail that you missed earlier. Monogramming machines are considerably good with their sewing speed. From a commercial point of view, this feature is where you can make the most of these machines. They can give you the final product in duration 3-4 times lesser than the traditional sewing apparatus. With so many benefits, it is really certain that by spending on a monogram machine you are making a good ROI decision. Monogram machines have been around for a while. Like any other technological gadget, they also get upgrades from time to time. Some of the best sewing manufacturers like Singer and Brother are offering an entire range of specialized monogram machines. 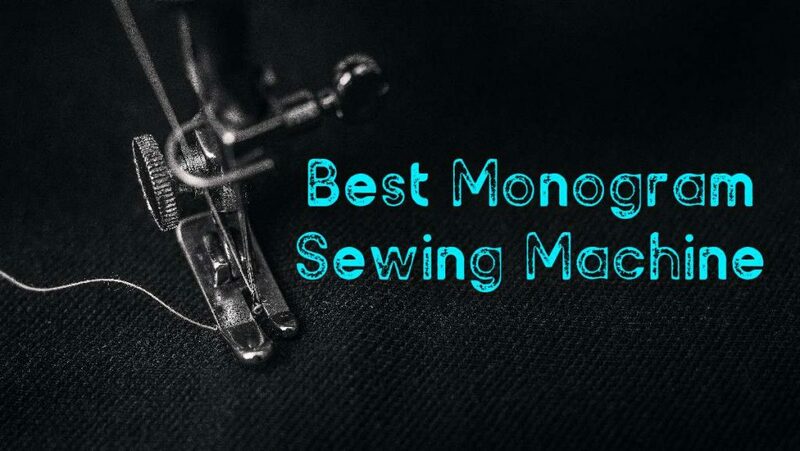 In this space, we are going to discuss and review some of the most recent and best monogram sewing machines in the market offered by these leading manufacturers. 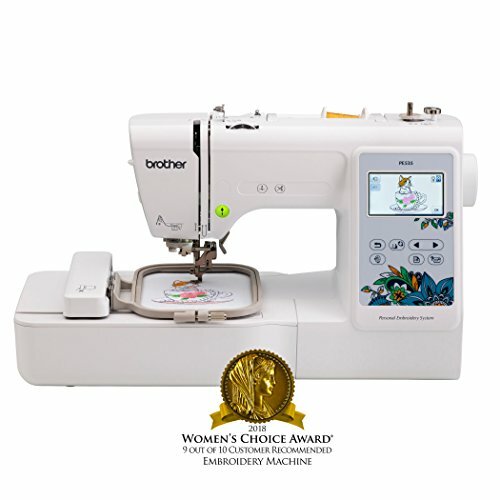 Brother SE400 Price: "This easy-to-use model embroiders really nicely. I love that it has a port for a memory stick so you can easily load any pattern." In order to make their monogramming products compact, many sewing machine manufacturers forget that some projects need bigger platforms. Brother, one of the best monogramming machine makers, has taken care of this crucial aspect in its SE400. Brother SE400 provides a larger working table/platform which is needed when you are dealing with embroidery on quilted fabrics. Experts think that the machine is an ideal pick for entry-level design makers. It’s high rating on Amazon also suggests that users have universally approved this product from Brother. Some of the important features of SE400 are discussed here. The machine comes with a projected LED. This feature comes in really handy when you have to work on miniature designs. The white illumination saves you from fatiguing your eyes. You don’t have to continuously peek at the cloth from a close range. The machine comes with 66 built-in stitch patterns. Not only that, but SE400 also have 70 distinctive stitching functions. In short, such stitching assortment gives you a lot of room for design experimenting. SE400 also have five built-in lettering fonts. This means you have enough variety to merge text with the graphical content of a monogram. The free-arm feature of the machine ensures that you can easily take on monogramming on large clothing items (curtains, banners etc). SE400 is also fitted with an LCD screen that streamlines the communication between the users and the machine. The cleaning of machines has also become really easy with its built-in sensors. All things considered, SE400 is a good monogramming option for small-scale proprietors and home users. With this long list of features, the price of SE400 seems pretty reasonable. 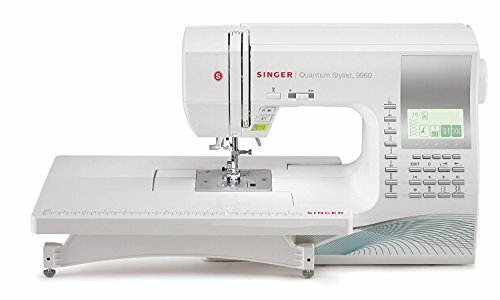 Singer Quantum Stylist 9960 Price: $276.48 "This machine compares very favorably with the current Bernina 550, for a fraction of the price." Singer has been catering to sewing consumer base for many decades. Up till now, the company has fully understood how to come up with a sewing machine tailored to the requirements of particular user segments. 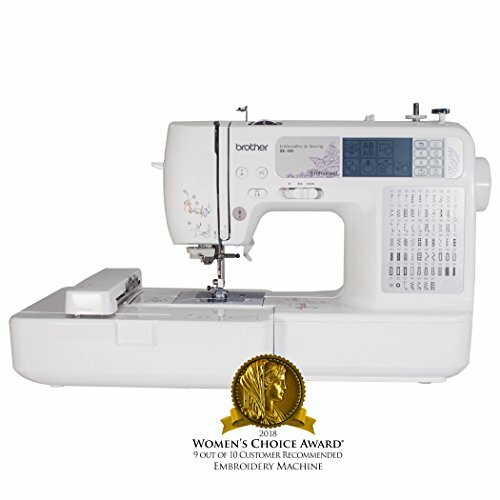 9960 Quantum Stylist is the manifestation of Singer’s experience in the sewing industry. 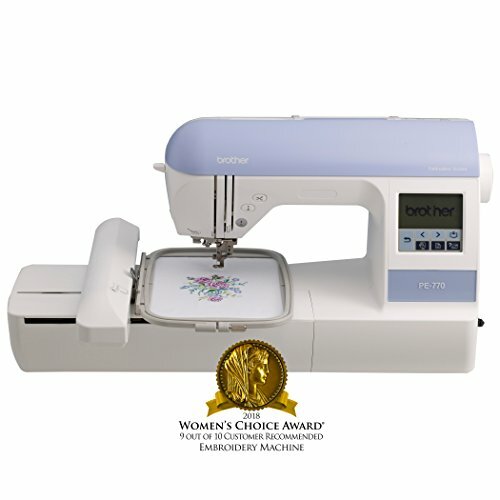 The machine is perfect for sewing, embroidery, and monogramming. There might be hardly any other sewing machine with such impressive all-in-one features. The machine price also makes it a perfect fit for both commercial and personal users. If we pick one thing that makes Singer 9960 stand apart from other similar machines is its automatic threading feature. You don’t need to waste your energies on this uncreative chore involved with sewing. With automatic threader, a user can thread the entire assembly of Singer 9960, from the spool to the needle’s eye, within six seconds. Besides streamlining threading, Singer 9960 has these noteworthy features. In design diversity, we believe that Singer 9960 has left behind every other monogram sewing machine of recent times. The machine comes with a whopping 600 built-in stitches. Yes, you have read that right. To get the best monogramming results, you can choose from five different specialized fonts. Moreover, the length of stitches can be modified through an automatic stitch adjustment function. The machines also have 13 built-in buttonhole designs. We think that Singer has added this feature to cater to the seasoned seamstresses and tailors. Singer has made sure that the 9960‘s speed can match with its diversity of design and monogramming. This is the reason why you can get up to 600 stitches per minute. With such amazing speed, it won’t be a problem to undertake any monogramming project no matter how big and extensive it is. Overall, Singer 9960 is a good deal. However, some users might have objection over the absence of quilting plate and average quality of buttonhole designs. Brother PE770 Embroidery Machine Price: "I have had this machine for almost a full year now and absolutely love it!" Brother has introduced yet another specialized monogramming machine in the form of PE770. By looking at its built-in features, it looks like as if it’s an all-purpose sewing machine. However, that’s not the case. Brother has just tried to add more strength to its monogram sewing machine by packing in more features in PE770. Some of the noteworthy features of Brother PE770 are as follows. Many times users just change their mind while picking a sewing machine by factoring in its working space. In any such assessment, all the other impressive features of the machine get eclipsed. Brother has made sure that users don’t snub PE770 just on the basis of the platform. So, here in PE770, we have an expansive working table where users can take care of every size of the monogramming project without any inconvenience. We can give full marks to Brother on taking care of both automation and digitization in PE770 at the same time. Features such as needle threader and automatic thread cutter cut down the unproductive time. In addition, the software interface allowing users to import numerous monogramming patterns adds up to the streamlining of the work. Since monogramming is the real deal in PE770, therefore it has the right built-in features for it. 67 stitch designs and five lettering fonts allow users to craft the monograms that look like the carbon copy of the sample design. Brother also provides with 70 built-in embroidery designs in PE770. This variety can come in really handy when you are handling a bulk of orders needing readymade designs. If you are looking for purpose-built monogramming machines, then you don’t need to look further than PE770. Regarding PE770’s downside, some people might find the LCD feature of PE770 a bit lacking. Brother PE535 Embroidery Machine Price: $364.97 "This was VERY easy to set up and use, and I have NEVER used an embroidery machine before." Brother has targeted beginner seamstresses who are interested in monogramming by introducing PE535. Its 4×4” sewing square makes it easy for entry-level professionals to deal with complex monogramming tasks without trouble. The digitization of the machine further improves its performance as a monogram sewing apparatus. Some of the worth-mentioning features of PE535 are given below. PE535 is certainly a fast monogram sewing machine if we consider it a tool of beginners. The machine is able to generate up to 400 stitches per minute. So, it’s better if we don’t box it in any category. Brother PE535 can be used for any monogramming project, depending on the skill level of the user. The spacious sewing platform and backlit LCD display make it easy for users to use PE535 without referring to its manual. 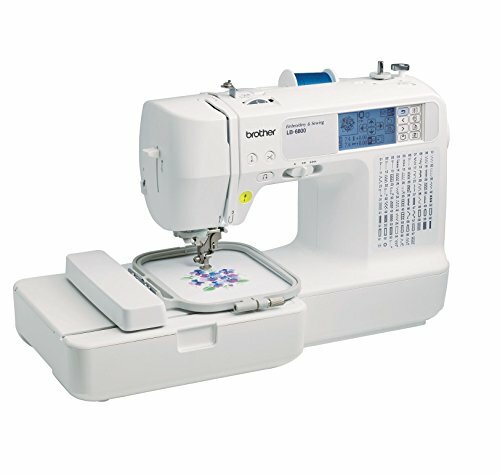 LB6800PRW is another of Brother’s monogram sewing machine that is highly rated by users. We believe that the combination of its stitching speed and the variety of monogramming makes it much loved among the users. The noteworthy features of LB6800PRW are given below. LB6800PRW wins with its monogramming variety. There are 67 built-in stitch patterns along with 70 readymade designs. By providing 120 built-in frame combinations, Brother makes sure that you can find the right template to realize your creative vision. Like other monogram sewing machines from Brother, LB6800PRW also have the standard five letting fonts. These specs surely make LB6800PRW a perfect fit for both functional and creative monogramming tasks. LB6800PRW wins the speed contest by providing over 700 stitches per minute. This speed can boost the entire monogramming process. The one-touch automatic thread cutter also contributes to the quick sewing and handling of the machine. Users who want large embroidery size might not like LB6800PRW as much. Nevertheless, it’s a good option in its price range. We have discussed and reviewed five of the best monogram sewing machines here. You can go with the one that fits your need of a monogramming machine and comes within your set budget.